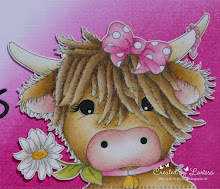 Hello everyone, it is Larissa with a another post on the Gerda Steiner designs blog. So happy to be back again today! Today I am showing you my thirth card that I made with the cute Pool piggies! 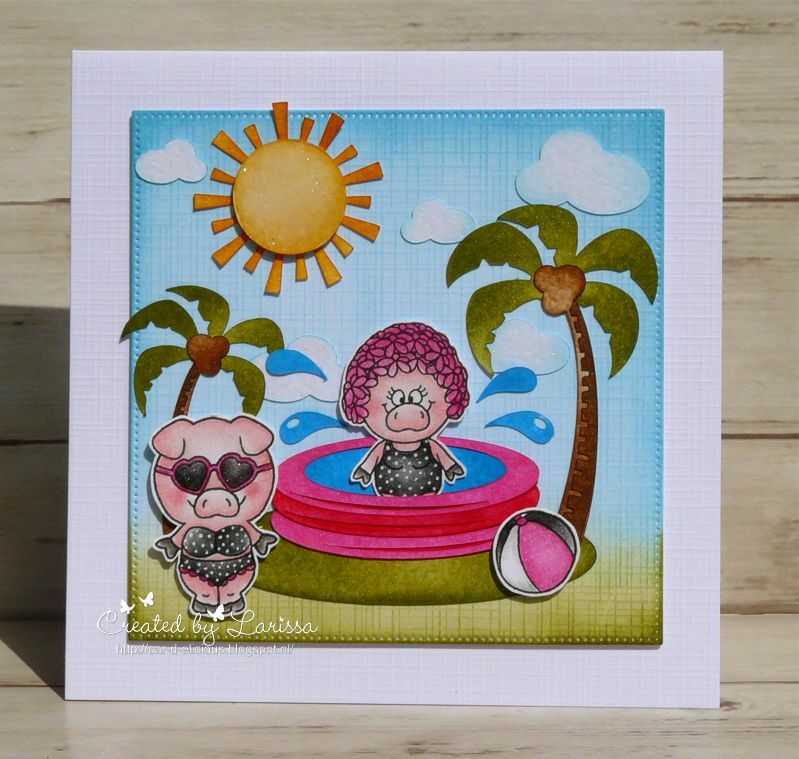 Today's card is my favorite from the set of cards that I made with the Pool piggies from Gerda Steiner designs. It was a lot of work, but I love the end result. I made a nice summer scene with the help of the pool piggies and a cut file from the Silhouette store. I really had fun making this card! I started with stamping the female piggies and the beachball from the stamp set Pool piggies from Gerda Steiner designs and then I coloured all images with my Polychromos pencils, the black glaze pen and the Clear Spectrum noir sparkle pen and then I fussy cut the images. With a white gelpen I have drawn little dots on the bikini and the swimming suit. I have cut a large square from white cardstock with the Crea-nest-lies XXL 50 from Crealies. I made a background on it with distress inks. On the bottom of the sqaure I used Peeled paint and for the sky I used Tumbled glass and Broken china. Then I used the silhouette and the cutting file Miss Kate bear in pool from Miss Kate cuttables to cut a swimming pool, a sun, 2 palm trees, a couple of clouds and water droplets for my scene. I have coloured all these parts with distress ink. For the swimming pool I used the colours Picked raspberry and festive berries. The sun is coloured with Mustard seed, Wild honey and Spiced marmelade. The water parts are coloured with Salty ocean ink. I have coloured the palm trees with Vintage photo, Ground espresso and Peeled paint. On the clouds I used a little bit of Tumbled glass ink. I adhered all these parts together with the piggies on the sqaure. Some pieces are adhered directly on the sqaure and for other parts I used foamtape and that way I have gotte a nice little summer scene. I adhered the sqaure with foamtape on a white card. I applied glossy accents on the sun and the sunglasses. Once I know who is going to get this card, I will stamp my sentiment on the inside of the card. 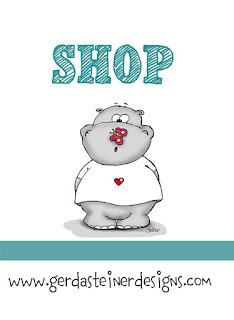 Next week I will be posting card 4 from this collection. INK: Mustard seed, Wild honey, Spiced marmelade, Peeled paint, Salty ocean, Mermaid lagoon, Vintage photo, Ground espresso, Picked raspeberry, Festive berries, Tumbled glass, Broken china distress inks. ACCESSORIES:Black glaze pen, Clear Spectrum noir sparkle pen, Glossy accents, white gelpen.